The Myers-Brigg’s Type Indicator (MBTI/True Colors) is the most widely used model of personality type, though it has a lot less evidence for its validity than the Big Five. Big data approaches to discovering evidence-based personality clusters will increasingly displace it. We’ll discuss one of those, StrengthsFinder, next. 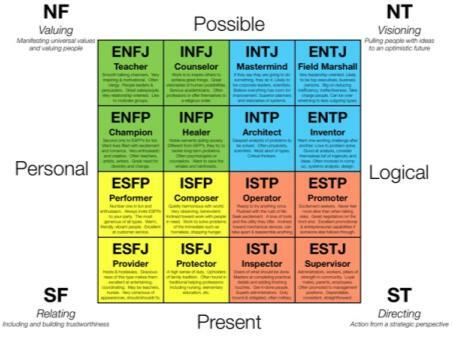 But Myers-Briggs is still very broadly used, and has some evidence behind it, so you should know the types, and your own type. The MBTI personality assessment was developed in the 1940s by Isabel Myers and Katherine Briggs. They extrapolated their four personality types from Carl Jung’s, 1921 book, Psychological Types. Jung proposed we have two main attitudes toward the external world: Extroverted, toward people or action, or Introverted, toward concepts and ideas (E or I). He also proposed four main functions of consciousness. Two perceiving functions: Sensation or iNtuition (S or N), and two judging functions: Thinking or Feeling (F or T). Myers and Briggs added a fourth dichotomy to Jung’s model, claiming people prefer to use either their Perceiving functions (sensation and intuition) or Judging functions (thinking and feeling) when they are oriented to the outside world (P or J). This set of four dichotomies makes for sixteen personality types (see picture above). There are a number of groups offering MBTI testing. HumanMetrics has a free quick online MBTI. MBTIComplete offers another for $50. There is also more detailed Step II version of the MBTI you can take from a certified practitioner, for around $200. In the 1980s, David Kiersey grouped these sixteen types into four “Temperaments” (the four colors in the picture above), and gave each type nicknames (Teacher, Counselor, etc.) to help communicate their character differences. His Kiersey Temperament Sorter has become one of the most widely used personality assessments in the world, though it isn’t officially affiliated with the MBTI community, who run their own assessments (above). As Clement Bezold of the Institute for Alternative Futures notes, certain types of individuals, like the practical, matter-of-fact ESTJs, can have no interest in creative, speculative foresight scenarios or aspirational visioning. Likewise creative ENTPs and healer INFPs may have an allergic reaction to anticipatory, quantitative foresight that forecasts a predictable, constrained future ahead. An effective foresight professional must be sensitive to the often substantial personality differences among their clients. To be most effective, we learn to lead with an engagement style that works best for our audience, and yet doesn’t compromise our ethics and duty to relay our opinion and evidence for it as best we can. Kiersey’s Please Understand Me II (2007) is a great introduction to using the MBTI categories to understand temperament, character, and intelligence. Other good starter books for MBTI are Kroeger and Thuesen’s Type Talk (1989) and for business settings, Type Talk at Work (2002). While no model is perfect, MBTI can help you see sides of yourself and your clients that weren’t visible before. It is so well-known and used that it should be understood by all practitioners.